Falkirk chairman Margaret Lang issued a statement last night detailing several areas of the club and answering questions that have been asked of the club since the start of the season. The opening results of the new season have been hugely disappointing and upsetting, but have galvanised everyone involved with our club. After the first games, when our performances on the field were falling far short of what we had expected, we acted urgently and decisively and have put in place an experienced management team capable of changing our fortunes. more than 90 points to play for in the remainder of the season. I am sure there will be other matters that supporters would like to raise and I am inviting supporters to e-mail me with their questions and I will respond to every one, as quickly as I can. My email address is margaretl@falkirkfc.co.uk. Greenock Morton are clearly unhappy about losing their manager. 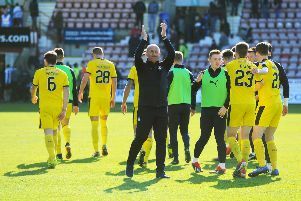 Did the Club act appropriately when approaching Ray McKinnon regarding the vacancy at Falkirk FC? Paul Hartley left the Bairns last month. Picture Michael Gillen. Yes. We sought permission from Morton to speak to their manager. During these discussions Ray made clear his desire to join Falkirk and, after discussions with a number of candidates, he was the outstanding choice. We appreciate Morton would have preferred to keep their manager, however, we followed appropriate procedures at all times. We are delighted to have both him and his management team in place to build a positive platform for the season ahead. How much of the Club’s budget has gone in compensation to the outgoing management team? Surely this means less money for Ray McKinnon to source new players at the winter transfer window? There were clauses in the contracts of the outgoing management allowing early termination. The Club’s rights were exercised and a total of £60k compensation was paid. While we had not budgeted for such a situation, the new management team understand the position and we have made clear to Ray that his team will be supported with recruitment. Following a full review of our financial structure at the end of 2017 we have now implemented a more robust and sustainable breakeven operating model. This means that when we bring in additional commercial income (for example through season ticket sales, match day revenue and sponsorship) or through player sales, sell ons or cup runs then these extra funds will now go directly to the playing budget rather than funding losses. In the media, Ian McCall and Jim McIntyre both indicated they had turned down the chance to manage Falkirk - was either offered the job? No. Meetings and discussions were held with both, but the only formal offer made by the Club was to Ray McKinnon, who accepted. With only a few games gone some fans want to know why Paul Hartley wasn’t given more time? Football is a results driven business. We are seeking promotion and want to compete well against all Clubs in the Championship. The early results were not what we expected and given our investment, the Board felt a change was needed sooner than later. We believe Ray McKinnon is the right person to take the team forward. Fans are angry that the quality of players brought in by Paul Hartley fell well short of what was expected. Is there enough of a budget to support the manager with incomings and outgoings in the January window? As when we dealt with the January 2018 window we would expect there to be outgoings as well as incomings. What was done there effectively balanced off. Given the budget model we are now working with any sums we accrue over budget can go straight to first team resources. How did the appointment of Richard Mitchell come about? When we interviewed Paul Hartley last September about the manager’s job Paul said that he wanted to be able to scout the marketplace in England without having to travel every week himself. He agreed with us that we needed to widen our scouting network from within the main central belt of Scotland. Following managerial changes at Ross County, an opportunity came to speak with Richard Mitchell about an initial six month role supporting Paul by scouting in England, essentially continuing the previous role he had at Ross County but now with Falkirk. We met with Richard and saw the potential that existed to dramatically widen our network of players, agents, clubs and contacts. We spoke with references of Richard’s who spoke very highly, and continue to speak very highly, of his knowledge and experience. Given we have a new management team in place, are we still committed to a Head of Recruitment based in England? Good recruitment is paramount to the success of any team. Our new management team have their own network of contacts in Scotland and in England. Given Paul Hartley’s short tenure, some have claimed the Board was wrong to appoint him in the first place. What’s your view? end of league season 2017/18, the points his team accumulated led to the Club finishing in eighth place. During this same period his win ratio was 50% and over 24 games the team accumulated 38 points which was second only to St Mirren over the same period. Unfortunately, that momentum was not sustained into the new season, despite significant investment in our first team squad. Why were Paul Hartley and Richard Mitchell allowed to sign so many players? players he wishes to have as part of his squad within the parameters of that budget. There were a significant number of squad changes in January 2018 which were successful in terms of pulling the club clear of 9 th place and accumulating the number of points we won in the second half of the season. A similar overhaul took place in summer 2018. This was done within the budget provided. It is not for the board to scout, sanction or veto any individual player signing unless there was a moral or ethical reason for doing so. That is why we appoint a manager. Each player signed was approved by the manager and the check and balance undertaken by the board was to monitor overall spend against the budget set. The decision to appoint Paul Hartley was made by the Board, many of whom have been in place for a number of years throughout our time in the Championship, isn’t it time for changes at this level? I understand the frustration of fans of our Club. All members of the Board share it. We have been in the Championship too long. Play offs and finishing second are not good enough. Board members are Falkirk fans too and, when making decisions, always endeavour to do so with the best interests of the Club and its future in mind. We want the Club to achieve the success that is long overdue, as much as anyone else. Do you believe we can still win promotion this season? give Ray and his team our fullest support. We will take advice from the new management team on what they feel is achievable, but the play-offs remain our aspiration. Given the Board’s track record in recent years, isn’t it about time you had someone on the board who understands the football world? i.e. Director of Football. the Board have been in Scottish football a long time and have good knowledge and contacts. However, there’s no doubt the Club would benefit from fresh ideas and strong football expertise. We are exploring options in this area. A lot of fans believe the decision to close the Academy and switch funds to player recruitment was short-sighted. What’s your response? A full business review was undertaken during the second half of 2017 that showed ever-increasing costs related to our development of young players. This included the Academy and ongoing development of players in our development team. The total cost at that time was £340,000 per year. This would rise to £433,000 in the first year under Project Brave and up to £467,000 per year by year three. This also excludes any capital or running costs of an indoor facility. This was unsustainable for a club of our size and in danger of putting the future of the Club itself at risk. Further, the cost of operating a full youth development set up was reliant on selling players every year or bringing in sell-on fees. Without this income the whole cost would need to be absorbed by our cash resources. With ever increasing costs this was a very risky position for the club and one that we felt was unsustainable. We would need to be sure of bringing in over £400,000 per annum in transfer income to sustain it and that was a gamble we were unwilling to take. Isn’t it the case that player sales via the Academy kept the Club afloat? It’s true the Club had become reliant on player sales to plug ever increasing losses at operating level. In the published accounts for the year ended 2017, the Club recorded a loss of £666,000. In that year, we finished second in the league and even after player sales were offset, the Club still recorded a loss of £303,000. The year before the operating loss was £664,000 and, again after player sales, there was still a loss of £130,000. It was simply not sustainable to run the Club on this basis and had Hull not bought Stephen Kingsley in summer 2017 the decision regarding cost cutting and withdrawing from the Academy would have had to be taken earlier. While we regret the upset the decision caused, financial projections showed that without substantial cost savings the Club would have run out of money by April 2018. We could not allow that to happen. Since 2011 the club has brought in £3m in player transfer fees and/or sell on fees. The cost of running the academy and development team during that period (using an average of £300k per year) was £2.4m - a surplus of £600k over the period or £75k per year on average. Of the total transfer income, 78% came from just two clubs (Swansea and Huddersfield) and 41% of it from just one player (Stephen Kingsley). Far from giving the club an annual cash boost these player sales were just filling a cash hole. A significant chunk of that annual hole was related to the costs of running a full youth development programme. The risk to the club was that if these costs were allowed to continue and we went a full 12 months without transfer or sell on income at or above £400k this would have placed the club at risk of running out of cash. How has this affected the Club’s budget going forward? As a result of a full operational and financial review, we have reduced costs by over £500,000 in the past eight months. Had we not taken this action the club would have run out of cash in April 2018. The cost reduction has allowed a sustainable financial model to be put in place. For the first time in a number of years we are operating with a break-even budget that is not reliant on player sales or cup run revenue to plug a hole in the finances. An early example of the benefit of this is that the income we received from the Scottish Cup quarter final at Ibrox allowed us to increase the 2018/19 player budget by 18%. Previously this income would have been used to reduce losses. In future any player transfer, sell on and/or cup run income will go directly to the first team budget. We continue to have fantastic support from season ticket holders, match walk ups and commercial partners and this area led by Kieran Koszary will continue to grow and offer additional unplanned income beyond budget to add to the playing squad. Without the Academy, where will the next generation of Falkirk players come from? An Academy is not able to produce year on year players who are either first team ready or sellable. Since setting up our academy, the majority of English clubs have changed their model. They now want players far younger than before as they feel they can develop them better. This means the market place and funds available are very different. The development of young players will continue through recruitment into our reserve team. The reserve team minimum age is 16. Had the SFA not introduced Project Brave, would the Academy still be running? Project Brave brought major challenges to our ability to run an elite academy. The criteria set came at a cost higher than we incurred in running our academy. We could not afford the essential criteria of having an indoor training facility. We were advised that if we did not have this we would not be granted elite status. This meant that we had to apply for a designation in project brave of less than elite. We had already experienced losing our more able players to the big four when we were an elite academy. The Head of Academy and other academy staff expressed their concern that being less than elite would mean we would lose the better players. Therefore, the combination of additional running costs, inability to fund an indoor training facility to the Scottish FA’s criterion and likelihood of losing the better players informed the ultimate decision. Also, it cannot be ignored that the finances of the Club were a key consideration.